The Whole Body Communion Tray is a single pass tray which serves both of the elements. 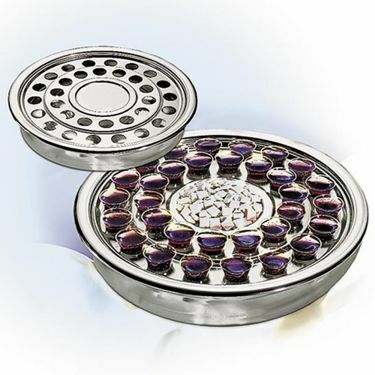 It is stackable with other Artistic communion trays and comes in brasstone or silvertone. The center depression is approximately 1/4" deep, and holds bread for 32. Room for 32 cups surrounds the bread. The Whole Body Tray can be used with the Communion Tray Cover and Base. Silvertone Aluminum has a permanent, polished finish due to an exclusive anodizing process and will never tarnish or need polishing. Because these items resemble real silver, they will match other appointments. Wash in mild soap and water. Do not use strong detergents, abrasive cleaners or metal polish.